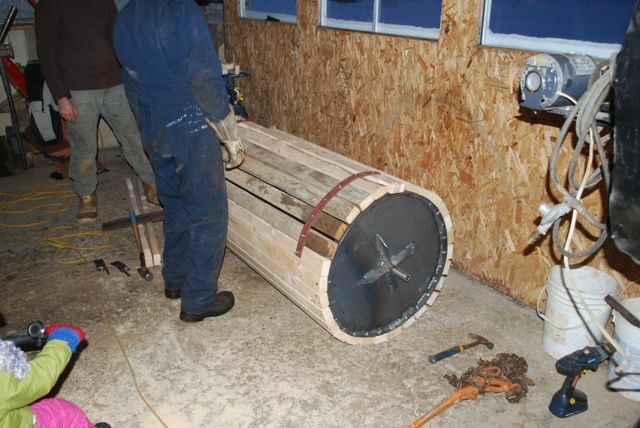 Issac Villeneuve built this barrel washer in the winter of 2012 while Bruce and I took pictures and helped (or got in the way). This was done as part of the Heliotrust farm efficiency project. Barrel washers make cleaning root crops so much easier and do a much better job than hand and brush washing. 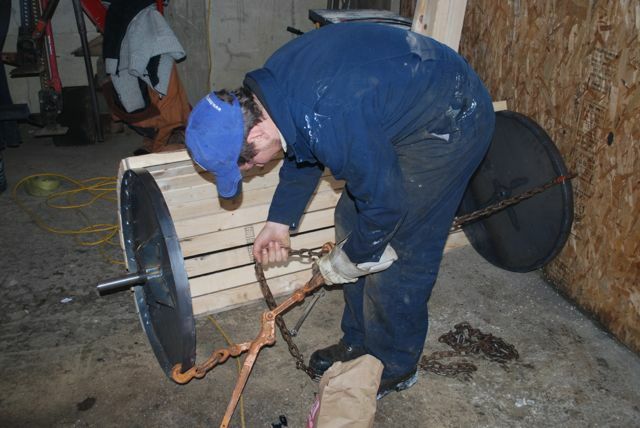 The hope is that people with metal working skills can build a sturdy and effective washer for a lot less than commercially available models. 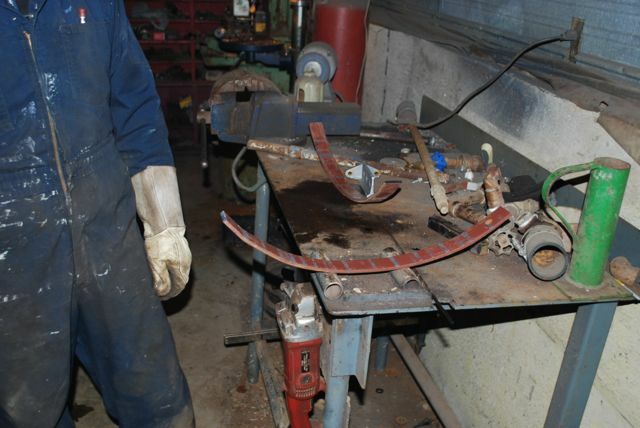 There is more about the root crop washers here as well as an update. The instructions below are a work in progress. I don’t think they are complete enough to guide someone without questions coming up unless you have the experience to work thing out as you go along. I’ll make myself available by phone and email to help however I can. As soon as I find more time, I hope to add a materials and cut list. One other thing. 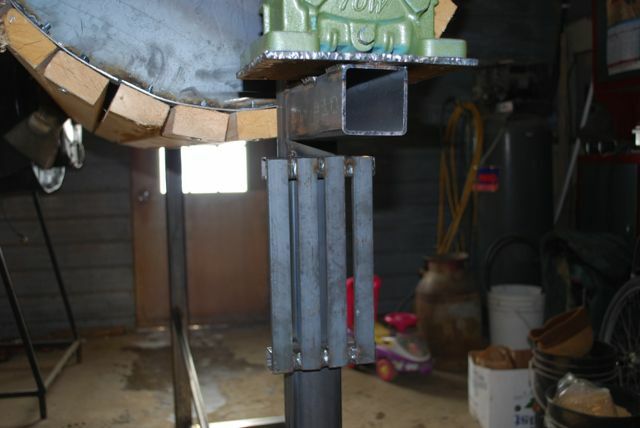 The washer is built high enough off the ground to allow a rolling table to slide underneath it for easy unloading. I have not built the table yet. When its done, I’ll post pictures and plans. 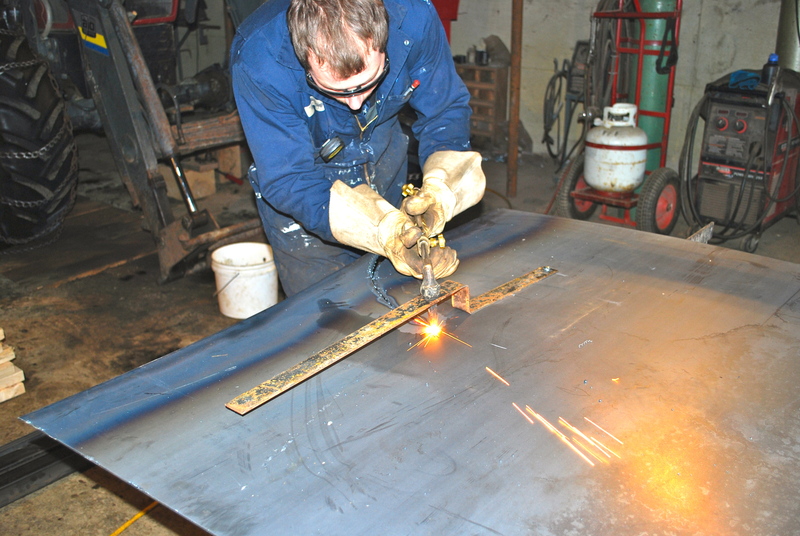 Begin by cutting out metal end pieces. 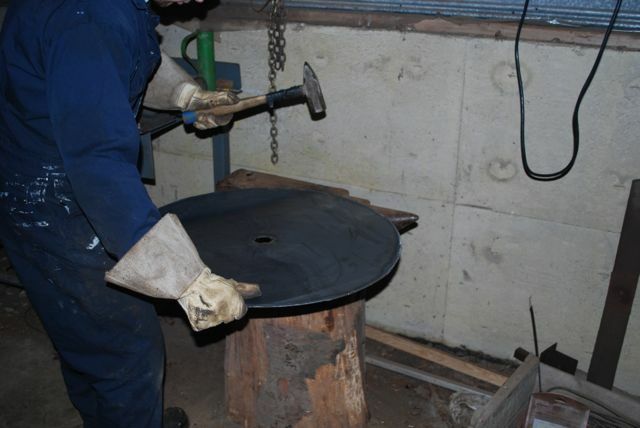 These are 30 inch circles of ¼” plate steel. 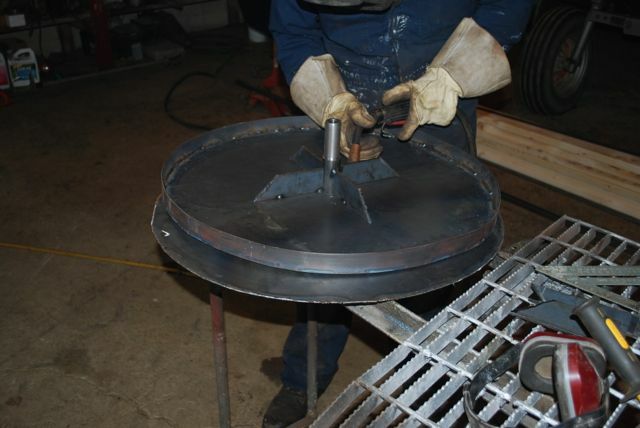 Isaac made a simple metal torch jig to make this job easier. 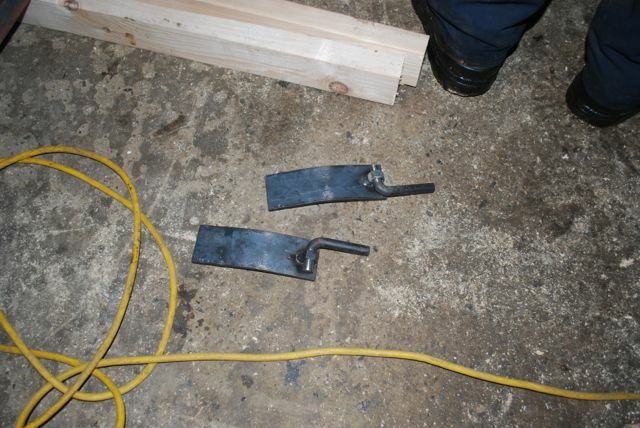 Using a hammer and anvil, release tension along the edges of the end-plates. This will make the plates less cupped. 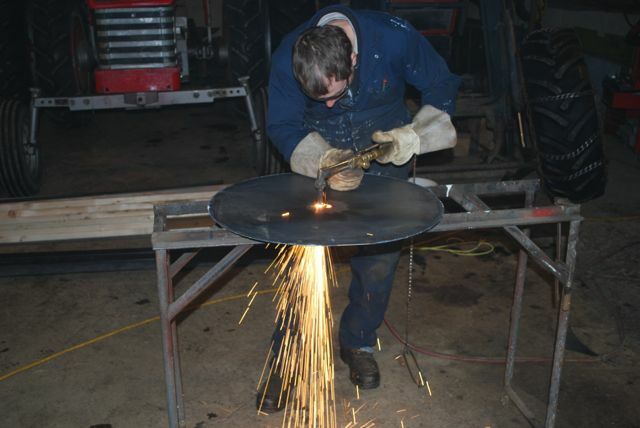 Tack weld on the plate rims, rolling the rim into position a bit at a time on the floor. 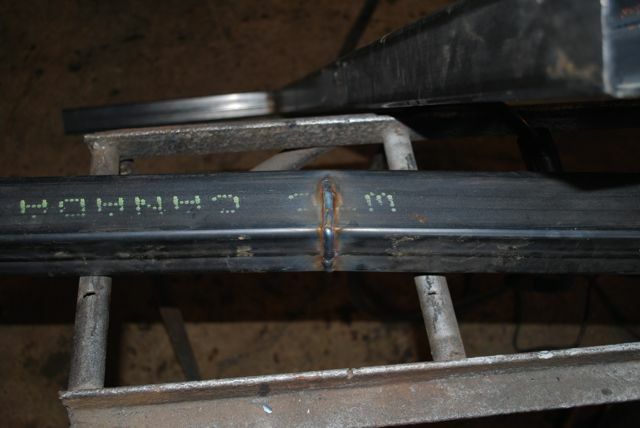 Once the rim is tacked on, weld it on permanently. Weld the hub shaft supports into place. Take care to square up the shafts. Cut a slot 3/4 of the way though the bottom “support foot” at the point the upright member will attach. 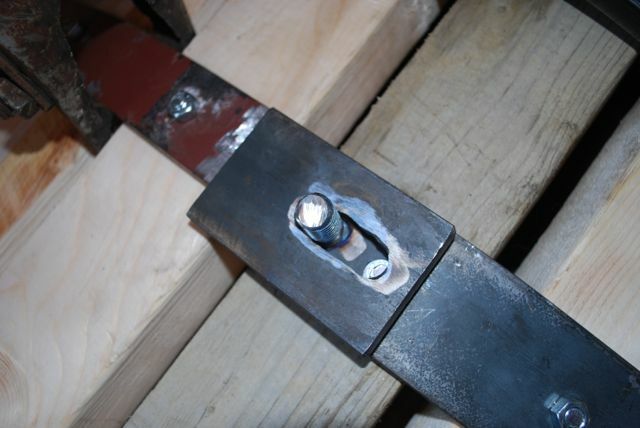 Bend the support foot at the cut and weld the cut closed. 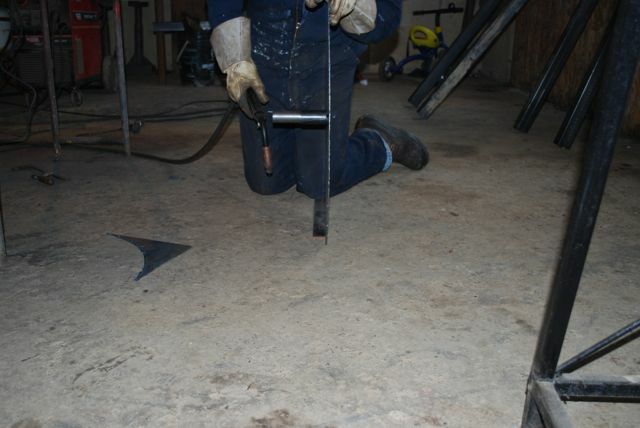 This gives the foot a curve to it, making it less likely to rock on uneven floors. Attach the wood slats to the end pieces. Put some on and then measure to be sure you are putting them on evenly. 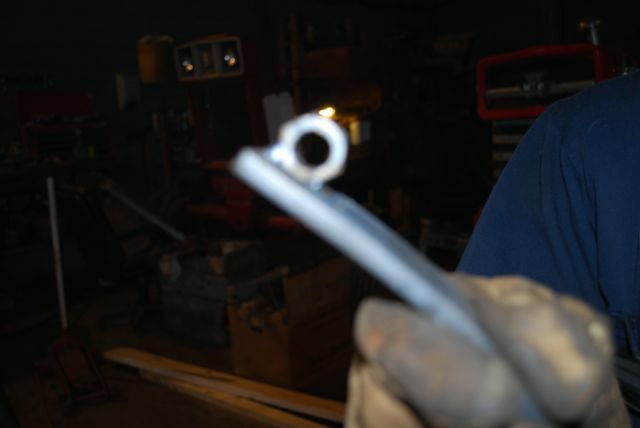 Use 5/8” bolts with large washers, one on each end, as spacers between the slats. 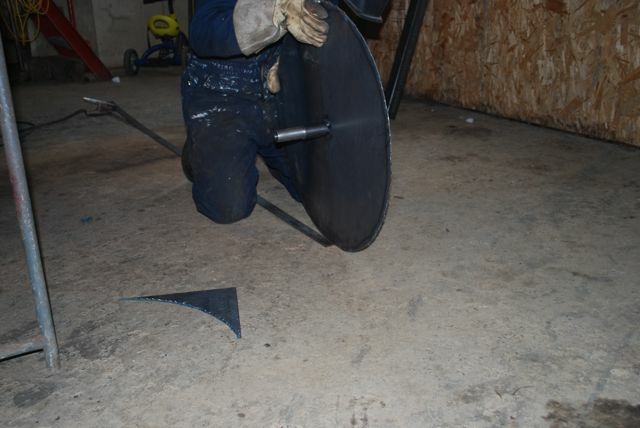 To keep the end plates even, we used chain and a binder to pull the plates in. Once half the wood is on, begin building the door by making the door support straps. These are formed using the completed side of the barrel as a guide. 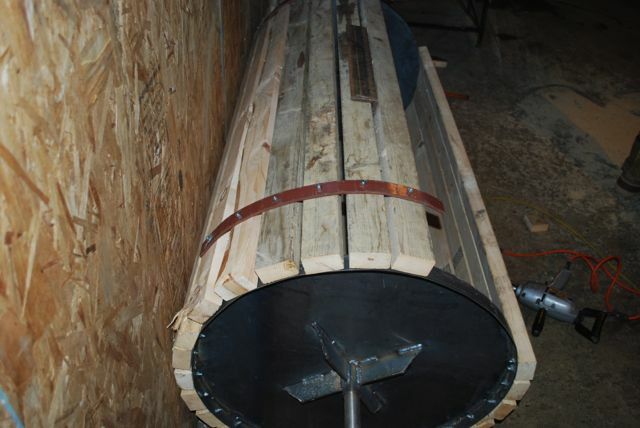 Hammer them into shape and check against the barrel until they fit the curve of the barrel. 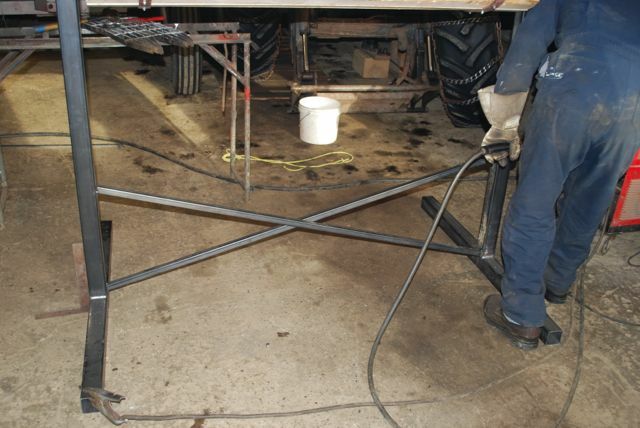 Once the straps are finished, mount the slats onto them and then weld on hinges. 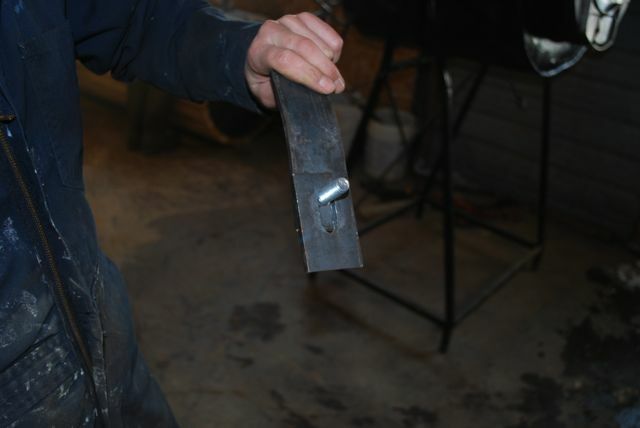 We made hinges out of a half-inch bolt and half-inch nut with the threads drilled out, welded to a small piece of flat stock. Weld on the hasp and spin-on nut closure to the other side of the door. 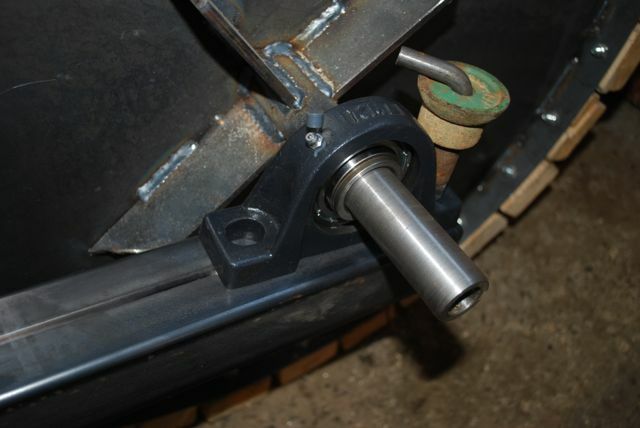 Mount the bearings onto the barrel and then attach the bearings to the frame. 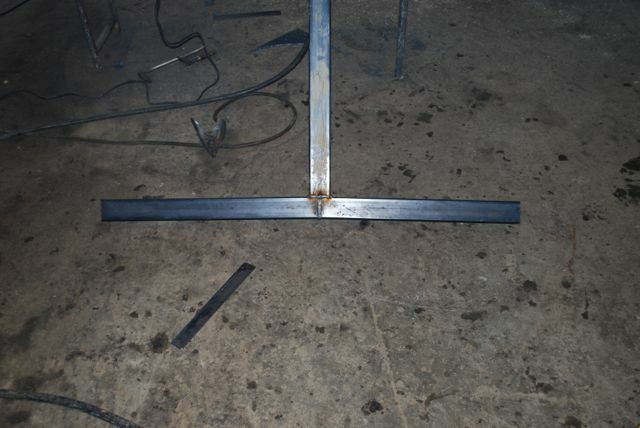 Weld on a shelf for the gear reducer with bolt holes, and bolt it on. Fabricate a mounting base for the motor. 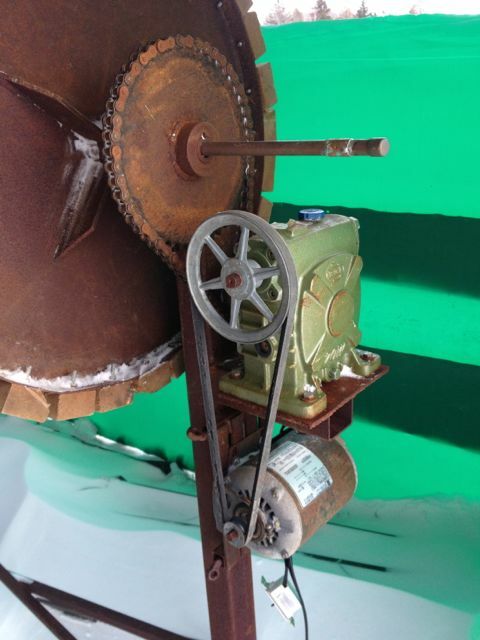 We built a slotted unit that allows the motor to hang, keeping the belt tight without adjustments. 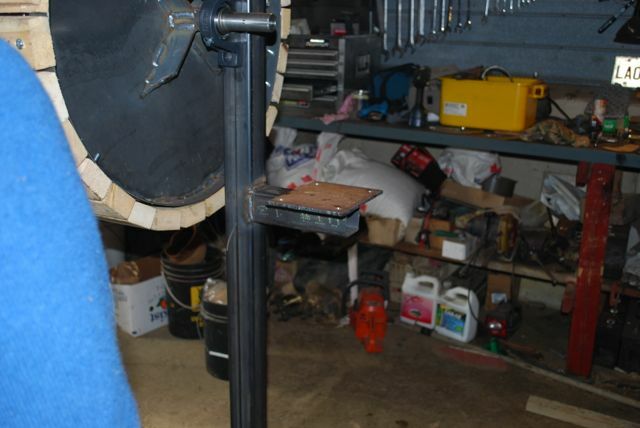 There are other ways of tensioning the motor including mounting it on a hinged plate. Mount the pulleys on the motor and gearbox. Thread the half-inch pipe with small holes drilled in it for water to steam out onto the produce being washed. Insert though the barrel, capping off on the gearbox end and mounting an elbow, valve and female hose thread adaptor on the other end. Please send feedback and pictures! 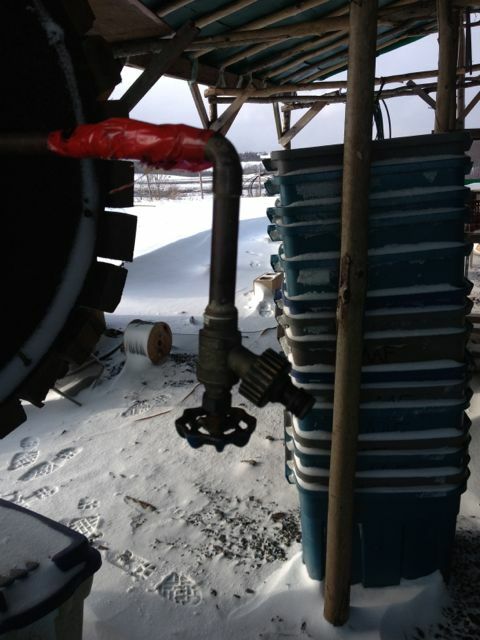 This entry was posted in efficiency, farm mentors, growing vegetables, potatoes and tagged beets, carrots, daikon, DIY root washer, potatoes, turnip, wash storage roots. Bookmark the permalink.